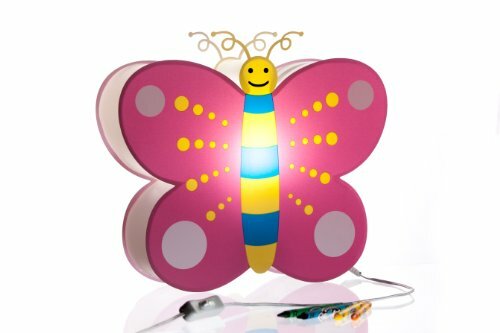 BeetleStar Nursery Lamps are an amazing combination of fun & colorful designs and innovative technology. Sporting fun designs your child will love, our lamps are practical and easy-to-use too. Providing a bright light source and activated from an easy-to-use on/off rocker switch on the cord, the lamps use an innovative low voltage LED bulb and low power consumption EnergyStar qualified wall adapter. Using an LED bulb means the lamp produces almost no heat. The low voltage power supply helps them consume just 1/10th the power of an ordinary lamp and makes it safer around kids and pets. (Parents, remember that the lamp isn't a toy and that cords of all types can be dangerous - be sure to place the lamp and route wires where little ones can't access them). The lamp's internal 4W LED bulb creates an incredible amount of light and the colorful designs help make the nursery a fun and creative environment. You'll love our BeetleStar lamps - see all six (6) designs at our Amazon store. Makes a great gift. If you have any questions about this product by BeetleStar, contact us by completing and submitting the form below. If you are looking for a specif part number, please include it with your message.